It’s no secret: in the age of big pharmaceuticals, biochemical approaches to mental health management are more common and readily accessible than talk therapies for many people. For a variety of mental health concerns, rapid advances in neuroscience have allowed for low-maintenance and effective symptom management. As university students, many of us can attest to long wait times to see mental health professionals as much as we can attest to leaving our first visits with prescriptions in hand. The most commonly used prescription medications for young people in Canada aged 15-24 (apart from female hormonal contraceptives) are antidepressants; they are now often one of the first lines of treatment in the management of symptoms of anxiety and depression. Canadian census data indicated that between 2007- 2011, 2.2 per cent of males and 12.3 per cent of females aged 15-24 used prescription antidepressants (StatsCan, 2015). Between 2010-2013 alone, studies indicated adolescent antidepressant use increased an additional 63 per cent. Within a multifaceted approach to health, these medications are viewed as effective in the majority of the population. Despite how prevalent the use of medication is, it can still be difficult to discuss their use and their side effects. Starting or stopping medications can be overwhelming, so The McGill Daily Sci+Tech presents a brief primer on what you need to know about antidepressants to better support yourself and those closest to you. In a separate class from antipsychotics, benzodiazepines, and mood stabilizers, most antidepressants work by preventing the chemical breakdown of key neurotransmitters, the molecules responsible for communication in the brain. Neurotransmitters are believed to be responsible for changes in mood and behavior. By increasing levels of serotonin, norepinephrine, and dopamine, these chemicals act to treat imbalances in these neurotransmitters. Neurotransmitters are endogenous chemical messengers, which means they are synthesized in the brain itself. You couldn’t simply “take more serotonin” if you needed to – the body must break down chemicals before they can pass through the blood-brain barrier, a very sensitive filter. Though the mechanism of action for many of these chemicals is not fully known, it is known that all neurotransmitters activate some target cell to produce a response before being reabsorbed by the body. Most antidepressants increase the duration of important neurotransmitters by delaying this process of reabsorption. ACETYLCHOLINE- responsible for muscle movement, considered to play a role in memory, mood, and learning. SEROTONIN- has a function in sleep, memory, appetite, and mood. DOPAMINE- plays a role in attention, memory, reward, sleep, cognition, and movement. NOREPINEPHRINE- works to regulate organ function, blood pressure, and heart rate. 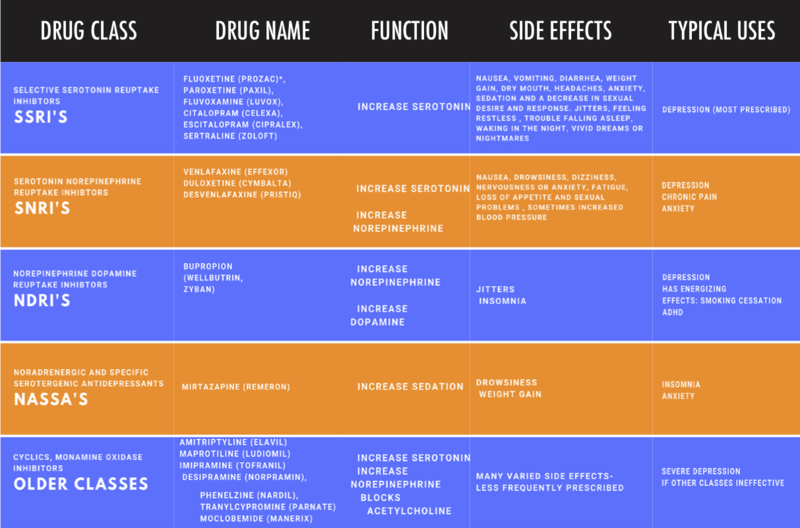 The chart above outlines the most commonly prescribed antidepressants, in decreasing order of prevalence, and the associated side effects for each. It is important to note that certain medications can increase suicidal thoughts or ideation. Though not common, in some individuals, increases in energy caused by medication can provide impetus to act on these thoughts, or cause increased anxiety. It is important to be honest with your healthcare provider if this is the case, so they can work with you to create a treatment plan that’s better for you. It’s equally important to make sure you know what support systems are available to you before starting any medication, and that you’re able to communicate with these people should you need to. Typically, when starting a new medication, the first week is reserved to assess whether you experience any side effects from the medication. Following this week, you will likely be prescribed a full dosage for an extended period to gauge whether the medication is effective in symptom management for you. This might mean changing medications or dosages. Usually, people taking prescription antidepressants take them for at least six months to a year to effectively manage symptoms. People who experience depression may need to take them for longer. If the medication’s symptom management is effective, you may decide you want to reduce your dose of a medication or stop altogether. Changes in dosages can greatly alter mood or cause mood episodes, so consider all the other facets of your mental health and the support available to you before you change your dose. Speak to your healthcare provider for their opinion, and if you don’t agree, consider seeking a second opinion. If you and your healthcare provider decide it is best to stop taking a certain antidepressant, it’s important to remember that though they are not addictive, they do cause withdrawal symptoms. Like any other drug, your body adjusts to the presence of the chemicals and has to readjust if you stop taking the drug. Symptoms of withdrawal can include chills, nausea, vomiting, diarrhea, dizziness, and headache. It is easiest for your body to slowly decrease its dose intake rather than stopping suddenly. It is typically recommended to reduce dosages 10 percent at a time – it may take several months to fully cut down a dose. If you start to feel unwell while changing your dose, speak to a professional who will be able to assist you in determining whether you are experiencing withdrawal effects or returning symptoms. The high frequency of prescription for antidepressants can make it seem as though they are the only viable therapy. Though medications are an effective method for many people, they may not be right for you. Other therapies, such as psychotherapy and cognitive behavioral therapy (CBT), are also effective ways to manage symptoms of anxiety and depression. Though it may seem that talk therapies and medications are “either/or,” a holistic plan might use both. Talk to a professional to get more information and find an approach to your health that works best for you, and don’t feel pressured to stick with one type of therapy if it isn’t working for you.